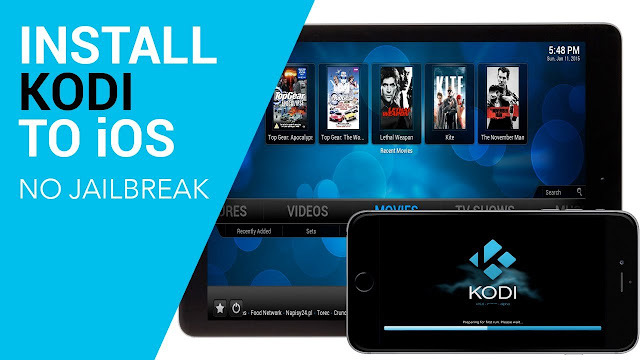 Kodi App is one of the video streaming application which is needed when you want to enjoy watching videos on your TV screens. Yes this is the app which can easily stream your favorite videos on big TV screens. But there is one big problem also that is installation of kodi App without jail breaking of your device, I can be easily done if you can make your device jail breaked but today we are going to tell you that how you can install kodi without any type of jailbreaking and without using your computer. It can play digital media very smoothly. You can stream live TV and recorded videos both with it. You can see all your videos, music and picture on your TV screen with Kodi. Also have the feature of making slideshow of all your pictures. Easily compatible with most of the formats. Shows amazing picture quality same as in your device. So this is a must have software. As if you love to watch all your data like pictures, music and videos or live streaming on big screens. So this app is for you. This very easily allow you to connect your device with your big screen TV and than all the control on your TV can be done by your device as you can watch live streaming on that, you can see your pictures, music and videos. All these are packed in KODI. First of all connect your iphone device to the internet connection. Download the playglass for your device from google and make sure that you download it from the official site. After the downloading, there will be a dialox box which is asking for permission of installation of the app then install the app. After the installation completed, go to the App store and search for kodi remote and download it. After installation of kodi remote, go to the settings then choose general and then choose profiles. Choose the trust the developer option which is there for play glass. Without this step kodi will not work. So this is the important step of this process. Tap on the home button and open playglass. And you will see that this is completely a kodi app with double screen, I recommend you to use this in landscape mode which will give you a great experience. Restart your device and enjoy the experience of Kodi un your iphone without any computer or break jail. Just follow these simple steps and you can easily operate Kodi in your iPhone without any computer and without having jail break. So this is all for the feature, and downloading procedure of Kodi in Phones without using jail break and computers. I hope this will help you, you just need to follow the steps as I shown above and there will be no issues to get the Kodi App Apk.